Link Building has been and probably always will be the cornerstone of good SEO. In 2018, it’s more important than ever to create a strategy that seeks out quality links. This doesn’t always mean that the best backlinks come from the most popular sites, but it’s still important to seek coverage from those relevant to your sector. Referral traffic will still add value to your organic rankings, and it’s useful to consider link building as a long-term process. Visual search is an intriguing new area for SEO to go, and the mixture of technological advances and user experience can take searching to another level. As the net shifts more into a visually based medium, we’re given a good opportunity to explore the power of visual search. Companies like Pinterest, Bing and Google have invested heavily in creating powerful visual search engines, hoping to get ahead of the curve. An SEO strategy in 2018 has to consider the way we’re consuming visual content, and how search engines now look beyond just text to display results. Visuals have now become more engaging, and the use of neuroscience and innovation have created an exciting and competitive market that will begin to take shape over the next 12 months. Strengthening your overall brand as a business is vital. When a brand is listed and recognised in the top SERPs, users are more likely to engage with their services or purchase their products. However, getting your brand out there is definitely easier said than done. Social media sites like Instagram and Facebook are free and should be utilised to bring attention to your name. And, while sites like Facebook are not typically used in the rankings list, they do provide you another avenue for traffic. Visual content is more than likely to be shared via social media, which helps people recognise your name. And, if they’ve seen it on Facebook, they’ll likely click it on Google! Search engine optimisation is an ever-evolving marketing strategy that requires you to constantly keep updated on the trends. If you don’t have the time to search all over the web, our free e-learning hub can help. Alternatively, we have dedicated SEO account managers ready to run your marketing campaign for you, operating on a transparent basis to help your business succeed! 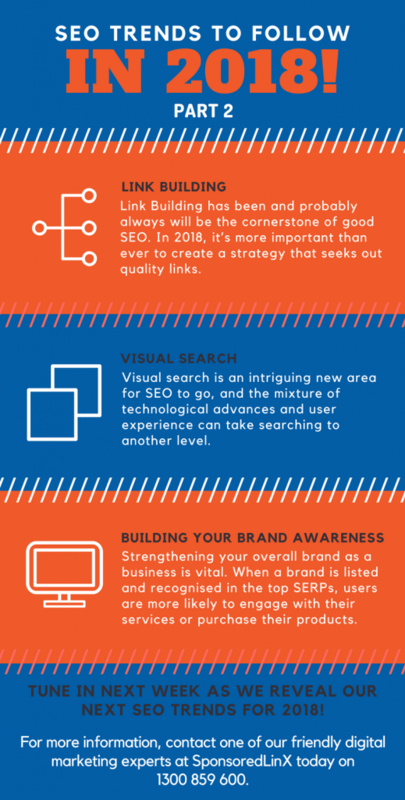 Don’t forget to watch our webinar on SEO trends for 2018, check back in next week for some more tips, or contact one of our digital marketing expert at SponsoredLinX today on 1300 859 600!